L-R: Ezra Barnes, Michael Gabriel Goodfriend, and Amy Griffin in THE ENGLISH BRIDE. Photo by Bob Eberle. 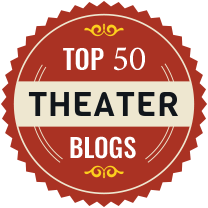 The English Bride, Lucile Lichtblau’s award-winning three hander, now playing at 59E59 Theaters in midtown Manhattan, is an absolute gem. Based on a real-life failed bombing attempt of an El Al flight from London to Tel Aviv in 1986, the play is, at one and the same time, a tale of terrorism and international espionage, a chronicle of lies and deceit, and a traditional love story. That question leads, inevitably, to many others. What were the real circumstances of Eileen’s relocation from Leeds to London? Did she truly love Ali? Did he love her? Was their original meeting accidental or premeditated? Who was the stranger who visited Ali? Did Eileen know who he was? And on and on. Finding answers to those questions is no easy task. Neither Ali nor Eileen are paragons of virtue, after all, and sorting out their lies from their truths would challenge the ability of Diogenes, let alone Dov. But in the course of the play, we do learn enough about all three characters to form at least tentative conclusions regarding what happened and why – although your conclusions may differ in many respects from mine and neither of us ever will be sure of the complete truth. The role of Eileen Finney is the juiciest part in the play and Amy Griffin milks it for all its worth, in a manner reminiscent of a young Rita Tushingham. She quickly makes it apparent that while Eileen may be one angry woman with a big chip on her shoulder, she is, at the same time, insecure and vulnerable; that we ought take whatever she says with a large grain of salt; and that she really is in love with Amir – unless, of course, it’s just that she’s in love with the idea of marrying him, bearing his child, and proving something to her mother and the rest of the world. Michael Gabriel Goodfriend is equally sure-footed in the role of Ali Said, effectively conveying Ali’s political anger and personal emotional ambivalences – that is if there really are any ambivalences to be conveyed. Eileen might lie if it suited her purposes but Ali’s lying bordered on the pathological – or not. Nor is Dov any less likely to distort the truth to his own ends as Ezra Barnes makes clear in a marvelously understated and controlled performance. He may not be the mirror image of Ali but they are worthy adversaries and the actors, themselves, play off one another in two sparkling performances. Last Friday we attended a workshop presentation of Damascus Square, a new musical co-written by Shai Baitel, Oran Eldor, and Sarah Hirsch, at 54 Below in midtown Manhattan. While the play still has a few rough patches to be ironed out (which is, of course, the reason for doing a workshop production in the first place), even at this early stage, we found this work in progress to be very promising - both stimulating and entertaining, with a strong book, a delightful score and clever lyrics. A full-scale staging of the musical is expected sometime next year and we’re very much looking forward to it. The musical is based on the story of Eli Cohen (herein played by Richard Blake), the Israeli Mossad agent who infiltrated the highest echelons of the Syrian Government in the 1960s and whose actions are generally credited with having played a major part in Israel’s subsequent overwhelming success in the Six Days War. In this re-telling, Cohen is revealed not only as one of the most heroic of Israeli patriots in that nation’s history but also as a much more complex man whose divided (and, at times, misguided) personal loyalties may have driven him in unexpected directions (somewhat reminiscent of Lieutenant Colonel Nicholson’s behavior in the classic film The Bridge on the River Kwai). It is an intriguing and provocative concept and one that is intelligently and effectively explored in this production by a first-rate cast including, in addition to Blake, Tovah Feldshuh as Tamara Sharon, the head of Mossad; Bradley Dean as Amin al-Hafez, the Ba’ath Party leader befriended by Cohen; Natalie Charle Ellis as Nadia Cohen, Ed Cohen’s wife; and Etai Benshlomo as Majid, the innocent intermediary who unknowingly facilitates Cohen’s undercover exploits. L-R: Jill Eikenberry, Carol Todd, Andrew Rein, Kevin Isola, Eleanor Handley, and Noel Justin Allain in JERICHO by Jack Canfora at 59E59 Theaters. Photo by Carol Rosegg. “Joshua fought the battle of Jericho and the walls came tumbling down…." 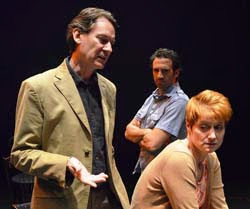 Currently premiering at 59E59 Theaters in midtown Manhattan, Jack Canfora’s Jericho is set in Jericho, Long Island, circa 2005, not in the ancient Canaanite city of the same name. But in the Long Island community, battles (albeit familial and emotional rather than nationalistic and military) still are being fought. Joshua – or “Josh” (Noel Joseph Allain) as he is known in the off-Broadway production – still plays a decisive role. And, perhaps most telling, the walls still come tumbling down. In fact, the walls (of the World Trade Center) came tumbling down on 9/11/2001 - four years before the play began, thereby setting the stage for all that was to follow. This is intended to be not only figuratively but literally the case: the stage is cluttered with debris, a mass of upended tables and chairs and other assorted non-descript objects, the flotsam and jetsam of the 9/11 attack, all of which the actors access in creating the sets for their subsequent scenes. This, in fact, suggests two things: first, that the characters current lives are really a consequence of the 9/11 tragedy; and second, that out of the chaos that the 9/11 attacks engendered, new and better worlds yet might be created. Alec (Kevin Isola) died in the 9/11 tragedy and his traumatized widow, Beth (Eleanor Handley) never fully recovered: despite medication and psychotherapeutic intervention, she remains delusional, refusing to accept the fact that Alec is truly gone and unable to establish an intimate relationship with another man. That other man, at least potentially, is Ethan (Andrew Rein) a patient and decent chap whose own brother, Josh, narrowly escaped death himself at the World Trade Center on the same day. That narrow escape apparently left Josh suffering both from “survivor’s guilt” and from an accentuated sense of his own “Jewishness” and it wreaked havoc on his marriage to Jessica (Carol Todd) who is understandably reluctant to join him in emigrating from Long Island to Israel in fulfillment of the sudden re-awakening of his sense of Jewish identity. Rachel (Jill Eikenberry), Josh’s and Ethan’s mother, continues to live in Jericho, Long Island in the house where she raised her sons, but she is about ready to sell the house and move on herself – not to Israel but to Florida where she could join her sister, Helen, in comfortable retirement in their golden years. But Rachel hasn’t left yet and, before she does, she hosts her traditional Thanksgiving dinner for her family: her two sons, Josh and Ethan; her daughter-in-law, Jessica; and Ethan’s latest flame, Beth. One need not be solipsistic to recognize that, at least to some degree, we all live in worlds of our own making and build walls around ourselves to preserve those worlds as we perceive them. For many, it is difficult enough even to think outside the box, let alone live outside the box, but should the worlds to which we’d become accustomed begin to crumble, as they so often do, we may be forced to face up to the unpleasant reality that our world might no longer be what we once imagined it to be or that it might be time for a change or that another’s world may not necessarily coincide with our own. And that is what this play really is about, not the the literal collapse of the World Trade Center as much as the figurative crumbling of the worlds we construct around ourselves and our need to construct other worlds over time to replace them. Thus, Rachel’s perfectly satisfactory original world was her Long Island home but ultimately she came to explore an alternate reality in Florida’s retirement community. Ethan’s free-wheeling Jewish-American world was up-ended when he began dating Beth – a shiksa of partial Palestinian descent. And while Josh’s youthful insular worlds in Long Island and Manhattan, may have satisfied his needs prior to 9/11, they proved inadequate for him in the days after 9/11; once terrorists destroyed the Wall Trade Center, he found himself forced to tear down the world of his youth, replacing it with an alternative orthodox Jewish religious community structure. This is a thoughtful and well-written play in which it seems that there is almost always more to a character’s persona than first meets the eye and all of the actors do a wonderful job of pacing their revelations to retain our interest throughout the entire work.. As we come to understand Josh better, we learn that the “survivor’s guilt” he feels at having survived the 9/11 tragedy has a deeper basis than we might at first have suspected. And we discover another dimension to Beth’s deep despondency over Alec’s death as well. Kevin Isola is charming as Alec (and as Beth’s shrink, Dr. Kim). Andrew Rein, as Ethan, exhibits a wide range of emotions in his various relationships with his mother, his brother and his girlfriend, Beth. 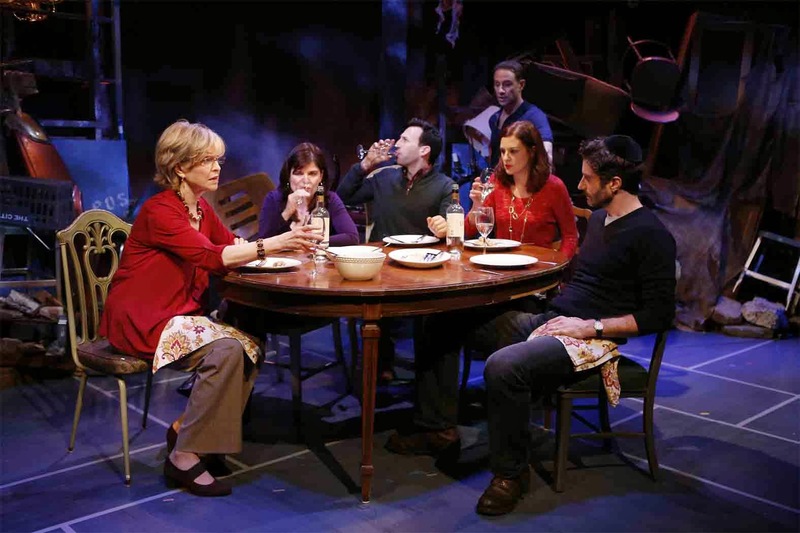 Not surprisingly, Jill Eikenberry is delightful as Rachel, a Jewish mother making a valiant effort to understand her children and keep her family together while attempting to build a life for herself. The role of Josh – son, brother, husband, newly-minted Zionist, and tortured survivor – is a particularly difficult one to play but Noel Joseph Allain does it with considerable skill. Eleanor Handley’s role as the mentally disturbed Beth role is far from an easy one either but she too pulls it off with great aplomb. But it was Carol Todd as Josh’s put-upon wife, Jessica, who I thought did the very best job of all, enabling the audience to actually experience the feelings of one whose world is falling apart in the most unexpected of ways. 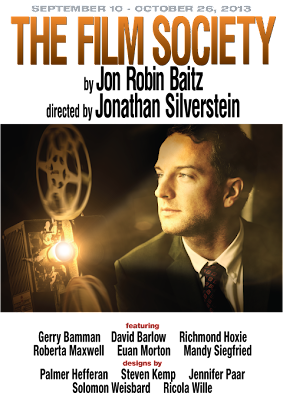 By the 1970s, the British Empire had begun to crumble and South Africa was still in the throes of Apartheid - and it is against this backdrop that all of the action in Jon Robin Baitz’s remarkably insightful play, The Film Society, takes place. Set in Blenheim, a boys’ boarding school in Durban, South Africa in late 1970, the play revolves around the inevitable changing of the guard at Blenheim and the conflicts and contradictions faced by Jonathon Balton (Euan Morton) as he attempts to balance his nascent youthful liberalism and his loyalty to his friends, Terry Sinclair (David Barlow) and Nan Sinclair (Mandy Siegfried) against his love for his school, his devotion to his mother, Mrs. Balton (Roberta Maxwell), and his obligations to the school’s owner and Headmaster, Neville Sutter (Gerry Bamman) - and all within the context of his own personal loneliness and self interest. Originally produced in Los Angeles in 1987, when Baitz was still only in his mid-20s, and making its New York debut a year later, The Film Society is now enjoying its first New York revival in an excellent off Broadway staging by The Keen Company at The Clurman Theatre at Theatre Row on West 42nd Street in midtown Manhattan. Directed by Jonathan Silverstein, the play effectively captures the ambivalent spirit of the times and the inevitable conflict between generations. On the one hand, we have Neville Sutter who has sought to navigate a gradualist course, modernizing the school’s philosophy by hiring younger, idealistic teachers like Jonathon, Terry and Nan while not fully abandoning the school’s traditional values. In his camp is his Assistant Headmaster, Hamish Fox (Richmond Hoxie), a retired military officer, who has clung even more tenaciously to the school’s old values – including cricket, penmanship, and caning, not necessarily in that order. And finally there is the wealthy Mrs. Balton whose deceased husband provided Neville with the funds he needed to purchase the school in the first place. And then there is Jonathon, whose sympathies well may be with Terry and Nan - it is he, after all, who seeks to expand his students’ horizons by exposing them to classic films, whence the title of the play – but whose ties to his mother, his headmaster, his school, and his own self-interest are what create the tensions that make this play so well worth seeing. What is seen as betrayal and “selling out” by one man may be interpreted as “becoming an adult,” or “facing reality” by another. That is the question that confronts us in judging Jonathon. Depending upon the choices he makes, will he be betraying his friends and “selling out” - or simply “growing up” and “facing reality”? Or is there even more (or less?) to Jonathon than meets the eye? Might his actions simply be a matter of his own self-interest or self-preservation – or even just a reflection of his own insecurities? The symbolism which permeates The Film Society is sometimes quite heavy-handed. Blenheim, itself, a declining boys’ school clinging to the past, may be taken as a proxy for all of South Africa in the days of apartheid. When Jonathon orders a copy of the film “A Touch of Mink” to show to the students in his “Film Society,” he receives a print of “A Touch of Evil” instead - a harbinger, one might suspect, of the unexpected consequences yet to come. Neville is going blind - reflecting, perhaps, his refusal to see the changes coming to South Africa - although they are all around him. And Hamish is suffering from terminal spine cancer – about which no further explanation would seem necessary. The heavy handedness of all that symbolism might best be explained by Baitz’ relative youth when he wrote the play and, had he been a bit more subtle, the play might have been even more effective.. But that is a very minor quibble over what is otherwise a very stimulating production and one well worth seeing.